What a great time of year to become mindful and aware of the light. Here we are in February, slowly emerging from our winter cocoon. The groundhog predicts an early spring. The length of daylight is gradually getting longer. 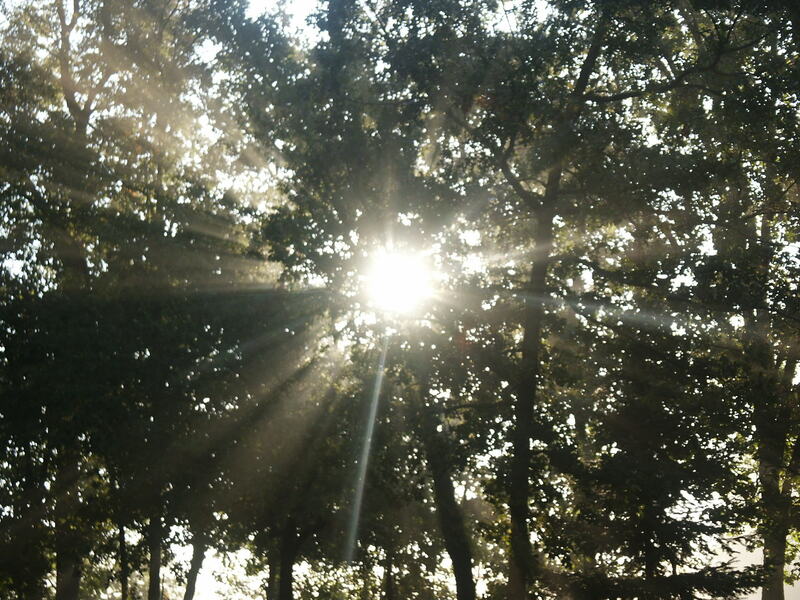 This week’s mindfulness practice asks us to become aware of light. Not just daylight, but also artificial light. Something that many of us have lived with for so long that it is easy to take it for granted. We don’t truly appreciate the light until we lose it, such as during a power outage. During the day, it may not be too bad. But when night falls, only then do we understand how important light is to us. Especially if you’ve tried reading by candlelight. For those of us in the Northern Hemisphere, our appreciation of light becomes evident during the winter when the days are shorter and the skies gloomier. We realize how precious a sunny day can be. How good the sun feels on our faces. And how about when we switch from daylight savings time? We get up in the dark and come home in the dark. The lack of light affects our mood. Notice how much lighter you feel when there is light? Light is therapeutic. It sparks energy and creativity. As you become more aware of light, you find it everywhere: sunlight, artificial light, bright and dim, direct or reflected. You notice how it moves throughout the day and how it changes colors. As you become more aware of light, you might also become more aware of darkness. While light and dark seem to be opposites, they actually contain and depend on one another. If there were no darkness-the night-we wouldn’t rest our eyes and bodies. This week, become more mindful of light, both daylight and artificial light. Notice how you feel when there is lack of light and an abundance of it. Practice grateful attention whenever you turn on a light switch. Categories: Environment, Mindfulness, Nature | Tags: artificial light, daylight, light, mindfulness, morgue file, Nature, SAD, sunlight | Permalink. I took a leap this month and entered one of my Ornimals into an exhibit. I haven’t entered any art into an exhibit in over a year due to some less than favorable experiences. But the exhibit at Handworks came at the right time. The Expressions of Love exhibit focuses on art made out of love. Love for a family member, a friend, an acquaintance. Someone or some event that represents love in its many forms. Each piece is accompanied by a story. Some are funny. Some bring tears to your eyes. All are heartwarming. 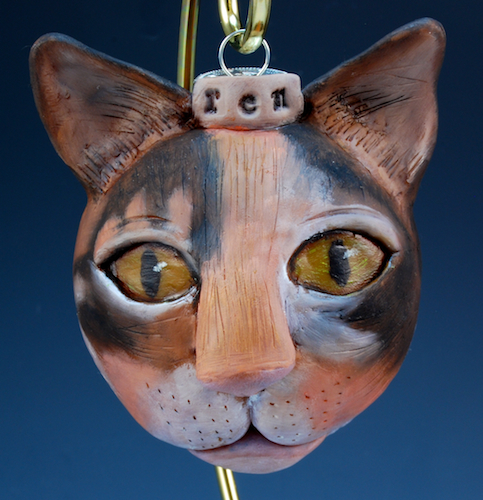 I entered an Ornimal I created in honor of our first cat, Ren. We adopted Ren shortly after getting married and moving to Massachusetts. 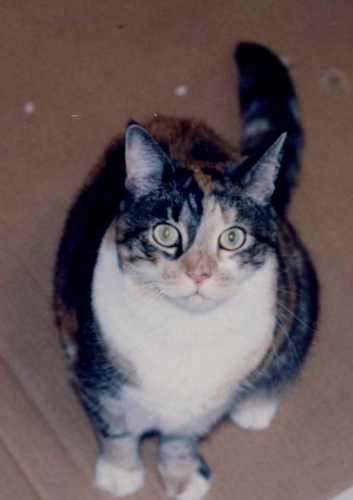 She was a beautiful calico who traveled with us to five homes and brought us years of joy. Here is the story I wrote to accompany this piece. I caught your eye at the shelter as I rubbed the cage door. “Take me home” I said. And you did. I cried all the way to my new home. We lived in a couple of apartments. You let me play in the sink water and sit on top of your fish tank. I told you I was a good hunter. I cried when you tried to keep me out of your bedroom. You gave in and I slept on your head. From then on we always snuggled at night, keeping each other warm. Sometimes you would take me on road trips to visit your family. Remember the time I sat on your lap and stared into your eyes while we waited to pay the toll? You got the message. One day we moved into a big house and I had more places to run and hide. That other cat you adopted scared me. But I forgave you and still slept on your bed. I got older and my body changed. Some things inside weren’t working right. You found a nice doctor and he tried to make me better. You were good at giving me shots and feeding me whatever I wanted. But over time, it wasn’t enough. My body was telling me something. It was getting close to my time to leave. When the end came, you held me close and that nice doctor gave me a shot. My fur felt warmer and my breathing relaxed. And then you helped me cross to a place where I run freely, catch fish in a big tank, and wait to snuggle on your bed again. 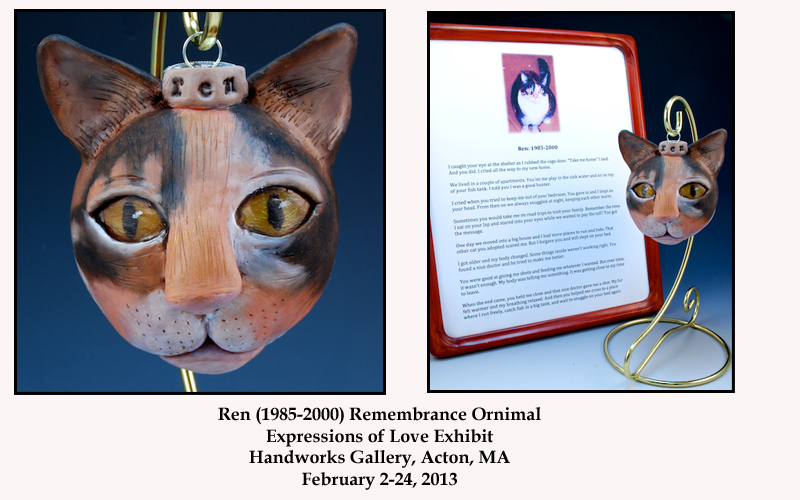 The Expressions of Love exhibit at Handworks Gallery is on display February 2-24. 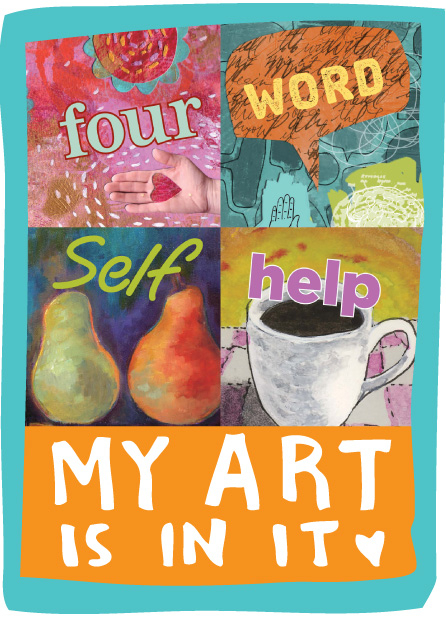 The opening reception is Sunday, February 3, from 1:00pm to 4:00pm. If you’re in the area, stop in to see all the great pieces. Note: Pieces in the exhibit are not for sale. 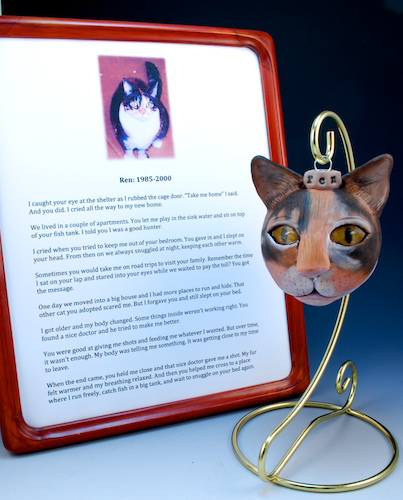 Categories: Amy's Art, Animals, Ornaments, Polymer Clay, Sculpture | Tags: animals, art exhibits, Cats, Expressions of Love exhibit, Handworks Gallery, love, ornaments, Polymer clay, Sculpture | Permalink. I paint pictures inspired by spirit, live Reiki, and count my blessings to a part of it all. 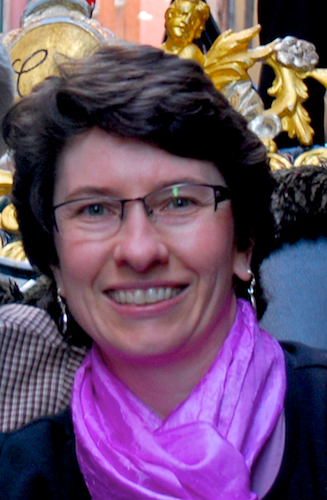 This blog is an expression of my encounters with art, Reiki, creativity, imagination and spirit. 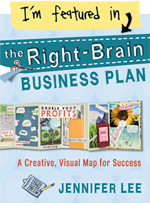 I’m featured in the Right Brain Business Plan book!